The following article first appeared in the March 2008 issue of EQ Magazine. Here's a link to the video for this story. Maybe Roger Franz got you thinking with his October 2007 article "Archiving Your Musical History," but during the years you've been waiting, the tapes on your shelves have been deteriorating. Maybe you even played some and got a little scared with what you heard. Well, if the problem is what I think it is, you can relax. To quote a friend of mine, "I have the answer." First I'll tell you my story, and then I'll tell you what you can do to revive those old tapes. And the answer is surprisingly simple and inexpensive. About four years ago I pulled one of my 20-year old reel-to-reel tapes off the shelf to do a re-mix. As it played, I was surprised at the loss of the high end, which got noticeably worse during the course of the three-minute song. I cleaned the heads and was shocked to find the cotton swab covered in what looked like pepper. Hey, that's my music there! (See the Q-Tip in the image at the top of this article). After playing a couple other tapes with the same results I decided it was time to get my hands on some digital equipment and transfer all my old tapes into the computer before they got any worse. I bought a Digi 002 from Digidesign because it has eight inputs, which would let me transfer all eight tracks into my computer in one pass. But as I started the transfers, it seemed I could only play about one minute of any song before I had to stop and clean the tape heads. Otherwise I could actually see the onscreen waveform grow weaker. It wasn't too hard to take the one-minute slices of audio and combine them back into a whole song, but it was tedious. If you don't match the waveforms up just right you risk getting a click. A twenty-minute tape requires twenty head cleanings. With hundreds of tapes, just the thought of it made me want to take a nap. I was telling a friend about the problem when he stopped me. "I have the answer." I thought he was joking. What's the likelihood that the first person I talked to would know how to fix this—and a non-engineer at that? My friend, Jesse, told me about a food dehydrator he'd been using to bake his tapes. He offered to let me borrow it. I had my doubts, but I was willing to give it a try. I had read about a convection oven method used by the engineers at Ampex, but I certainly couldn't afford to rent time on one of those babies, let alone buy one. Paul White had written about a method using a plate warmer, something apparently used in high-class European households. But at $750 plus shipping, those units seemed a bit expensive. At least with a food dehydrator, you can use it to make jerky afterward. Jesse told me to put the tapes on the shelves and set the machine to 120-135 degrees for two hours, turning the tapes over every half hour. Then I should let them cool for the same two hours before playing them. Since I had doubts about the whole process, I started with a tape I didn't care too much about. Before baking it, I verified that it stuck to the tape heads and sounded terrible within a couple minutes. After the four-hour heating and cooling process I slapped it back on the tape machine. It sounded great! Not only that, but after playing the whole reel, the heads were almost as clean as when the tape was brand new. You may have already heard of sticky shed syndrome. Your tapes are made of iron oxide and a backing. The iron oxide is mixed with a glue that makes it stick to the backing. It turns out that over time that glue absorbs moisture and gets gooey. There are many variations of how this might affect your precious tapes. I had nearly every symptom there is. Some tapes turned gummy and I could see shiny, sticky patches on the surface that look like the goop from adhesive tape. As the tapes ran, I could hear snapping and popping as the gooey stuff would release from layer to layer. Other tapes would fast-forward or rewind at such glacial speeds I thought my machine was broken. With still other tapes, I could hear a high-pitched screech as the tapes went across the heads. The worst symptom was when bits of the tape got stuck to the heads (and anything else the tape touched along the path between the reels) and literally peeled off - sometimes in little flakes and sometimes in string-like shavings up to an inch long. Now you can see why I was so terrified. After I had baked about 100 tapes, it occurred to me that cassette tapes, DAT, Beta and VHS videotapes, and the data tapes used to backup computers are all made from the same stuff. I decided I needed to get my own dehydrator. American Harvest has a 1000 watt unit. You might think you can process more tapes that way, but I have some concern about the magnetic field a larger motor might produce. As it is, I don't use the bottom tray just in case the motor might affect my tape. The SnackMaster is expandable to 12 trays, but I'm not convinced that the same amount of heat can process a larger number of tapes. 7-inch reels will not fit in the machine. In the center of each plastic tray is a crown-shaped piece that sticks up to prevent the fruits and veggies from falling to the bottom. You can use some wire cutters to snip out the crown. I used a rotary tool (similar to the one made popular by Dremel) and got very nice results. It half saws and half melts though the plastic. Then I filed down the edges. It leaves behind some plastic dust, which you should vacuum off the tray. Even then you might work the surface over with some adhesive tape, since static electricity will hold some of the flakes behind. Don't run the machine with the translucent fruit roll sheet inside. You want the warm air to circulate. Any time you move the dehydrator, check the thermostat because the knob turns pretty easily just rubbing against your clothes. You don't want to melt your musical babies. Consider taping it in place. Don't try to use your kitchen oven for this job. The thermostats aren't that accurate, and they don't move the air around enough to evenly heat the tapes. Do not bake acetate tapes. Watch out for tapes with splices. Old splices have a tendency to break anyway, but the heating make it worse. Just keep your eye on them both in play and rewind. Clean the heads often, even though they won't be as dirty as before baking. I let the tapes cool by laying them on top of empty plastic yogurt cups so that air can circulate all around them. It seems to me that as they cool, the moisture and temperature should have a chance to escape completely. The absorption process took years. I don't imagine moisture can be re-absorbed any more quickly the second time around. Again, I have only my results to point to. Although all my tapes have been 1/4- and 1/2-inch, you can make the machine work with wider tape. You'll have to make one of the trays into a spacer by cutting the webbing away from the outer ring. (American Harvest also sells a Convert-A-Tray which is a ring with no webbing.) Then you put the tape on the tray below and use your new spacer to support the next tray up or the lid of the machine. When working with wider tape, I suggest increasing the heating and drying times—not the temperature. Try adding an hour for 1-inch tapes and two hours for 2-inch tapes. 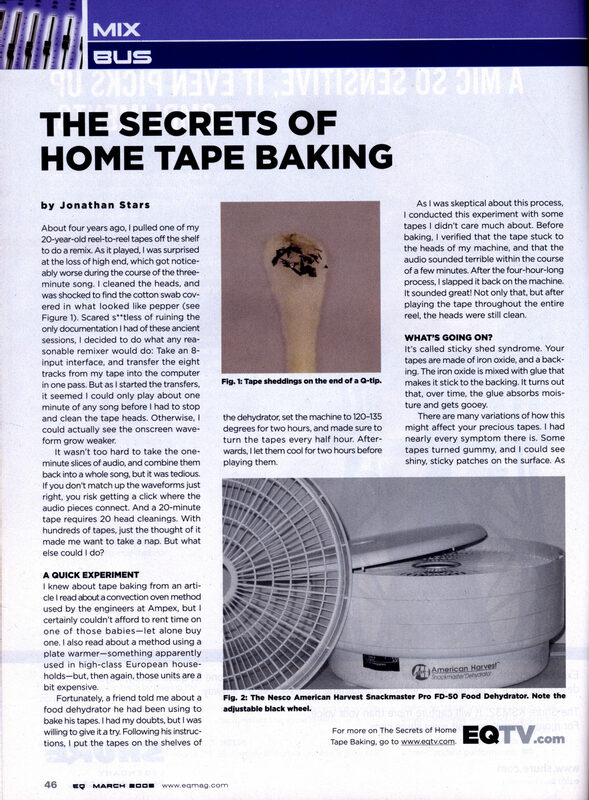 If the tape still has problems playing, try baking it a second time. I'm not going to tell you how to store the tapes. As far as I'm concerned there isn't much point, since they'll continue to degrade. I tossed all mine into the trash. It's time to get into the digital age where you can keep exact duplicate copies in multiple locations. Which brings me to the topic of backups. Make 'em! Click here for a comprehensive article on backups. So now that you know the cheap and easy story, you don't have any more excuses for not getting started on your transfer project right away. And you can offer your tape restoration services to other clients. Just don't tell them how inexpensive the "special equipment" is. Jonathan Stars has been a musician and recording engineer for more than 40 years. He is also a FileMaker Pro database expert who wrote seven editions of Learn FileMaker Pro for Wordware Publishing. The last version was Learn FileMaker Pro 10. Click here to find his novels on this website.